1. Excessive flattery, praise, or admiration beyond normal; especially, when done in a servile way: In hopes of getting a substantial raise, Manfred sent his boss a flattering e-mail filled with adulations and an invitation to go for a coffee break together. 2. 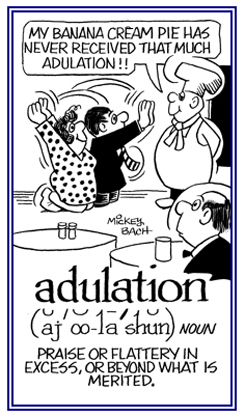 Abject adoration or great admiration and praise: The critic expressed her adulation and enthusiasm in the local newspaper regarding the dramatic production at the local theater last weekend. 3. 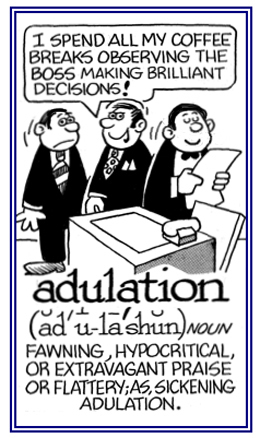 Etymology: from Latin adulationem and adulatio, "a fawning; great flattery", a noun of action from aduliari, "to gratify the vanity of"; from ad-, "to" + ulos, "tail". If you were to imagine a dog wagging its tail to get a treat or to show a lot of friendly behavior, you're thinking is correct. 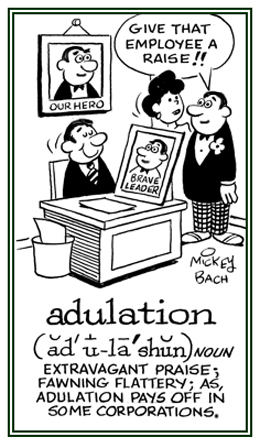 Adulation is considered to be one of the more doglike characteristics of human behavior.